A fan favorite character with a tie to Grant Gustin’s Barry Allen will be appearing in the fourth episode of The Flash. 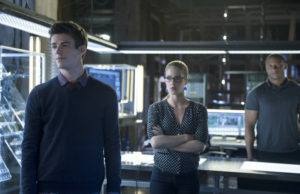 Not only will that episode welcome Wentworth Miller as Captain Cold; it will also feature a guest appearance by Emily Bett Rickards as Felicity Smoak, her character from Arrow. 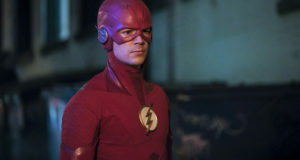 “Barry had a big impact on those characters when he came on, and then subsequently, there was some discussion about what had happened to him, and then bringing Carlos [Valdes] and Danielle [Panabaker] onto Arrow… it would have been wrong to not deal with a lot of those emotions, especially since I think that as much as there are ‘Olicity’ fans, there were ‘Baricity’ fans, so we really wanted to address that,” Andrew Kreisberg told us today in a one-on-one interview at the press tour. Kreisberg promises us it’s not a gimmick. 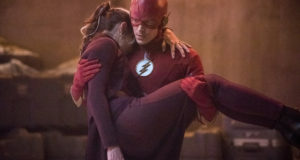 “It’s an episode where Barry’s beginning to question his teammates, and Felicity coming along is not just to reconnect with him; it actually serves a grander purpose, which is that Felicity is somebody who knows how difficult it is to have teammates who are fighting crime. So, she’s there to offer some sage advice, both to Barry and to to Caitlin, Cisco, and Wells. So we’re really excited,” he says. The title of the episode is “Going Rogue” and we are assuming it will air October 28 on The CW. WOOOHOOO WE NEED MORE COMMENTS ON THIS SITE!!! Could this be true? They’re showing my beloved Felicity Smoak with…FRIENDS?!?! Yes!!!! A thousand times, yes! Non-Oliver related FRIENDS! I am a happy happy fan. I can’t wait to watch. Looking forward to see how they deal with the Barry/Felicity dynamic. yes, more Emily Bett Rickards is always welcome. Haha, doubt that, considering 95% of Arrow’s fanbase is Olicity pro. I’m excited to see this united DCTV universe come to life. I’m particularly pleased that Felicity will bring a strong connection between both shows and look forward to her continuing existing relationships with Barry, Cisco and Caitlin as well as possbily developing relationships with Iris and others. So happy Felicity’s coming on Flash for an episode, she’s my favourite from Arrow. Glad they’re not pursuing anything romantic between her and Barry. Both have enough love interests on their own. this how an important character like Felicity sd make guest appearence. I for one am really excited that Felicity will be on Flash. There’s no one better to give some advice on how to deal with stubborn superheroes than her. On Arrow, one of the main reasons Oliver Queen is the hero he is today is Felicity Smoak. Her faith and belief in him is something that Oliver values above all else. Then there’s the fact that she never takes Oliver’s BS. So, she can definitely give some pointers to Caitlin, Cisco & Wells on how to reign in cocky, stubborn superheroes. I’m thinking Barry’s gonna be acting more crazier and taking more risks than Oliver. Ya know, since he’d probably think he is invulnerable. That means ‘Team Flash’ will need lots of advice from somebody who has more than enough experience in that department. Somebody like Felicity Smoak. This is so exciting. I can’t wait to see Felicity interacting with Caitlin & Cisco. Loved it when they popped up in Arrow. This Fall’s gonna be one crazy season filled with all my favorite heroes. YAY!! I’m really optimistic about this show after seeing the leaked pilot. It looks like they’re setting up all the most iconic flash villains which could eventually lead to a rogues rebellion type story? I can’t wait to see Captain Cold. I also want to see Felicity teach Team S.T.A.R. Labs how to work as a group with a team that fights crime. I also can’t wait for the two hour crossover during the 8th episodes of the season. That is one episode before the Mid-Season finale. Weird, I thought I posted a comment here! I am very excited that Emily Bett will be crossing over to the Flash! She is the absolute best thing to happen to Arrow. And as much I loved the premise of the show, Felicity and Diggle make this show happen and without them I would probably not stick around. Thanks for the article and wonderful news! Do you know if Felicity will be crossing over for episode 8 as well?